Welcome to the world wide web home of the Baheyeldin dynasty. 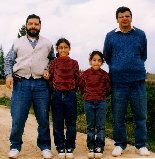 Here, you can find a profile of an Egyptian family, with part of it living in Canada, and part living in Egypt. You will also get some insight into what an Egyptian family looks like, their interests, and various other aspects. This picture includes all the members of the Baheyeldin Dynasty, as on March 2000. Khalid - the eldest and leader of the dynasty. You can take some time to explore this extensive web site containing various topics on Egypt, Canada, and other places, as well as writings on various topics such as history, linguistics, Open Source Software, Linux, and more. Suhaila - the eldest daughter, and the first of the third generation Baheyeldins. Sarah - the younger daughter, and second in the third generation of Baheyeldins. Omar their uncle (Khalid's brother). Hope you enjoy your visit here. Why this site is called "The Baheyeldin Dynasty"? Well, I got asked that question by more than one person in the last week. One of them even asked if I am descended from the Pharaoh of Egypt and hence the dynasty!Well, no. I don't think I am descended from Pharaohs. My ancestry on my father's side is Syrio-Arab, and Circassian. On my mother's side it is Moorish. You can see more in the ancestry section.So, what was I thinking when I called this site the Baheyeldin Dynasty? Read more about Why this site is called "The Baheyeldin Dynasty"? Suhaila is on the Honour Roll, for acheiving above 80% consistently for four consecutive semesters.Well done again Suhaila, and keep it up. Sarah has improved her marks in Science significantly. She went from 70s% all the way to 93%, earning an honours on her diploma.Well done Sarah! The title should really read: "Distant relatives finding you via the internet" ...Running a web site is an experience that is full of surprises.One pleasant surprise is when someone reads your web site and discovers that they are a relative of you, and gets in touch with you for details.About a year ago, I had someone contact me after reading the paternal side of my ancestry. He is living in the village my father is from. After some emails, we discovered that my paternal grandfather and his paternal grandfather are brothers. It is very interesting how we humans acquire language as babies. Just by listening and observing, we acquire language and meaning, build vocabulary and grammar. It was interesting to see how Salma, my baby daughter, did this. This is not a full fledged study, but rather a collection of observations. Example 1: English or Arabic? Early on, just after she turned one year, Salma started saying syllables. What we noticed is that she understood both English and Arabic words (which is to be expected, her not knowing the difference). What was amazing is that when we presented her with two terms for the same thing, one Arabic and one English, she picked the easier one to pronounce, although she knew the meaning of both words being the same. Too often, people do not receive the recognition they deserve for acts they did in a timely manner. In this article I wish to write a tribute to my mother, Elham Abou Youssef إلهام أبو يوسف, in order to thank her for what she did.My mother's saga started with my father's prolonged illness and battle with chronic liver disease. This illness caused him not to be able to work in the last few years of his life. When he finally died, he left me (six years old) and my brother (two years old) in the care of my mother.Although she was in her early thirties then, she never thought of remarrying, nor to send the boys to their paternal grandfather in the rural village of El Sakakra. Instead, she went back to work in order to provide for the two young boys.